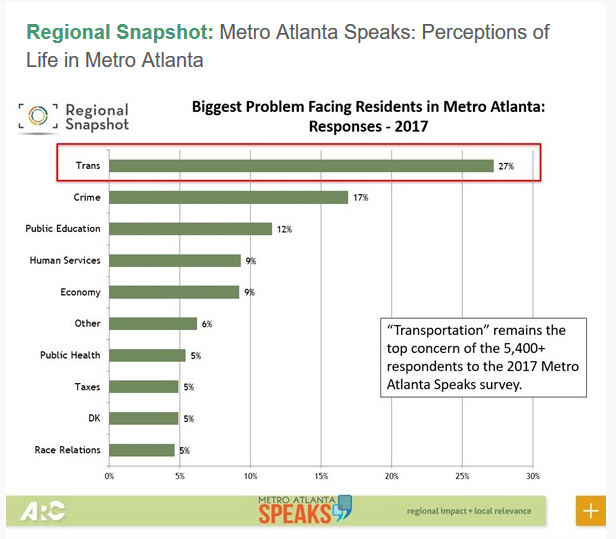 Each year since 2013, the Atlanta Regional commission (ARC) and its community partners conduct the Metro Atlanta Speaks public opinion survey to take the pulse of metro Atlanta residents and help guide the region’s planning and decision-making. The survey offers an annual snapshot of residents’ views on a range of critical issues, such as transportation, the economy, education, aging and neighborhood quality of life. 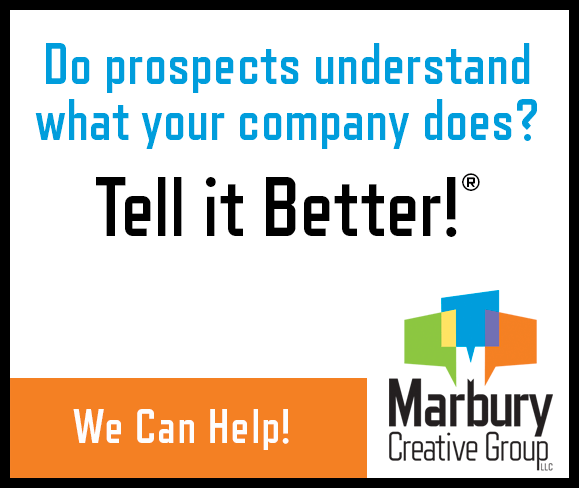 November’s Regional Snapshot begins to dig into the results from the 2017 Metro Atlanta Speaks survey, comparing responses among the counties surveyed and offering insights as to how different segments of the population responded. Last Thursday, December 7th, the Census Bureau released an annual estimate series that we data nerds await with near-bated breath–almost like a little kid waiting for Santa (yes, really…yes, we know). Anyway, those data are the 5-year estimates from the American Community Survey. What makes them so useful is that they are reported at many geography levels, all the way down to the census tract and blockgroup. That small area reporting allows us to look at trends between the 2007-2011 and 2012-2016 editions of the 5-year datasets–periods of particular interest as they respectively mark the “centerpoint” of the recessionary period (in the case of 2007-2011) and the “centerpoint” of the recovery from the recession (in the case of 2012-2016). The 10-county region’s population as a whole increased by 304,000 across the periods. Map 1 dives down to the tract level to show the absolute change between the 5-year periods. The pattern of growth is perhaps more balanced than might be expected. Though higher-growth tracts are more frequently located in the northern part of the region, very few areas south of I-20 (other than Clayton County) show declines. 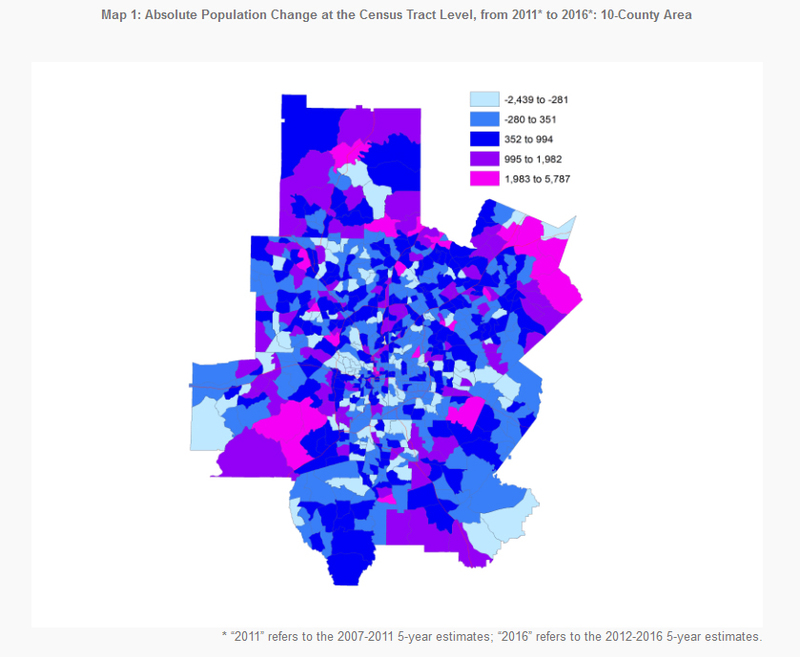 Fulton County and Gwinnett County led the ten counties in absolute increase; the only significant cluster of population loss in Fulton was in the southwest part of the City of Atlanta.